Independently owned Mexican joints are everywhere these days and thank goodness, because it used to be Chi-Chi’s was the best so-called “Mexican” food available around Lexington back in the day. Things have changed immensely for this city’s entire restaurant scene in terms of available ethnic food selections, authenticity, and depth of choices within each ethnicity. But with anything as plentiful as Mexican and Latin American food as a whole these days, some are better than others. Many have acceptable food, but it’s the atmosphere that makes the restaurant. Folks will turn out for okay food if the happy hour margaritas are cheap and especially if the restaurant is conveniently located. 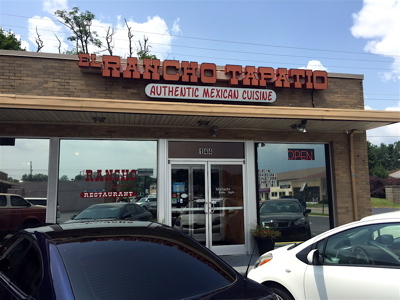 I recently found a joint in El Rancho Tapatio that has excellent food, inexpensive prices, a fun atmosphere, great servers and is conveniently located. It’s hidden on a little shopping strip just off Nicholasville Road, at 144 Burt Road, ironically located behind a Taco Bell. It’s not a new place, but it’s new to me, and I’m very happy to have found it. 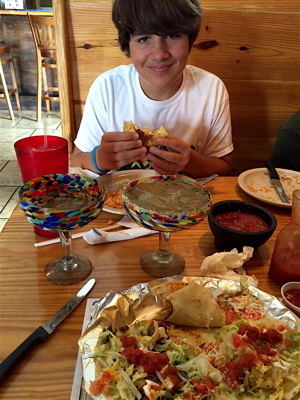 Gabriel enjoying his stuffed quesadilla. Do yourself a favor and go try their tacos. Maybe skip the ground beef one, it’s rather generic, but the shredded chicken and shredded beef were both outstanding, with rich, authentic flavors bursting with each bite. I did soft tacos, but I learned they make their own corn tortillas, so try the hard or soft shell corn tortillas if they are being offered. The lunch special with three soft shell tacos, beans and rice was $7. Plus there were two-for-one margaritas. The chips seemed like they were prepared on-site, and the salsa was wicked good. The kids and I couldn’t stop eating those suckers. I want to go back and try a couple items: Fajita Especial: grilled chicken, steak, shrimp, and chorizo with grilled onions, tomatoes and bell peppers, served with all the trimmings for $14.99; Tacos de Pescado (fish tacos) for $9.50; and one other item I didn’t see on the menu was Tacos de Carne Asada. I’ll be asking if the kitchen would mind hooking me up with an order of those next time. I must admit that I didn’t find El Rancho Tapatio by accident. The credit goes to Rachael Ray. She published a list of “The 64 Best Tacos in the Country“, and Lexington had two restaurants on the list: El Rancho Tapatio and Panchitos. A third Kentucky restaurant also made the list, La Mexicana Restaurant in Newport. I’m guessing they are referring to Panchito’s Express at 340 E. New Circle Road in Lex, 859-294-0022. That is on my list to try soon. Regardless, I’m duly impressed with El Rancho Tapatio. It scored three thumbs up from my kiddos and they are tough judges.